A Security and Surveillance Conference is being held in San Francisco on the mezzanine level of the St. Francis Hotel at Union Square (map) and Caul is in attendance. A vendor goes through the motions of pitching his product to him until he notices the name tag ... he switches gears, pressing him to accept a free sample, anything to be able to associate his product with the man considered preeminent in the field. Then ... Caul is sitting in at a presentation when one of his team runs over to invite him to come meet a competitor, another well-known surveillance expert. and Now ... this was filmed in the Colonial Room at the St. Francis. Except for the mural on the wall, attendance at a presentation in the same room today would offer an deja-vu experience. Then ... In the main hall Caul meets the competitor, the also-mustachio'd Bernie Moran (Allen Garfield), but is surprised and hurt to find that his assistant Stan, below left, is now working for Moran. and Now ... the convention booths were set up in the Grand Ballroom at the St. Francis, pictured below in this recent photo. For the movie scene the booths were set up on the right side of the room - the part of the wall seen in the background above is where the white screen (on the right) is mounted below. Then ... Further evidence indicating that these scenes were filmed in the grand ballroom comes from on-the-set footage (an extra on the DVD) which includes this shot from behind the cameraman clearly showing the room's raised ceiling areas where the chandeliers hang. and Now ... the raised ceiling areas viewed from the same spot. Then ... Caul finds a telephone in a quiet part of the hotel to call his girlfriend Amy but is told the number has been discontinued. True to her word (described here in an earlier post), she doesn't want to see him again. Note the model of the St Francis Hotel and Union Square in the foreground. and Now ... this spot is on the hotel's second level, one up from the Grand Ballroom. 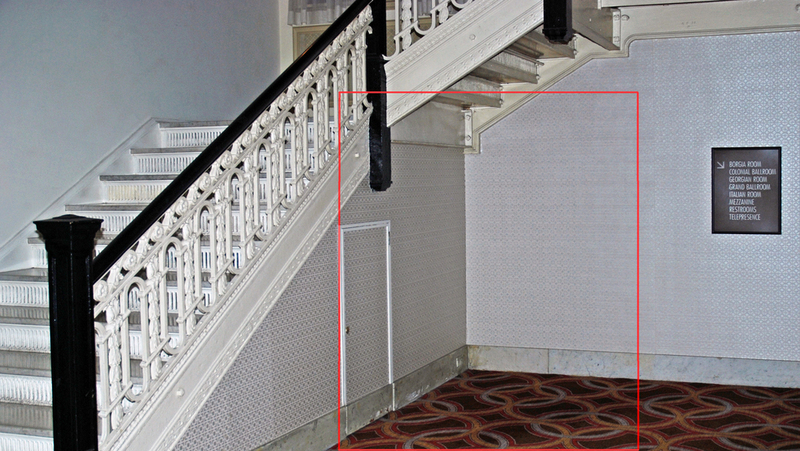 The red border outlines the camera's field of view above - the telephone has gone but there's still an under-stair closet. Then ... Who should be sitting there watching him make the call but The Director's assistant Stett. Caul is furious, accusing him of following him, but Stett brings a message - the Director is back in town and is ready to receive the conversation tapes in person. In this carefully framed shot both Caul and the hotel model are reflected in the mirror, extending the confined space in a most effective way. and Now ... artwork featuring the Bay Bridge has replaced the mirror but it's still a place for casual seating. Hotel guests can sit here and sense the presence of Harrison Ford - "Feel The Force!". (Oops ... wrong movie).